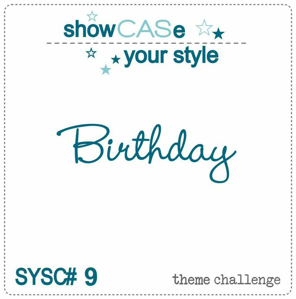 It's time for SYSC #9! Easy peasy! I always need birthday cards for my stash, so this was a great challenge. Happy Everything, and the "birthday" is from Birthday Balloon. 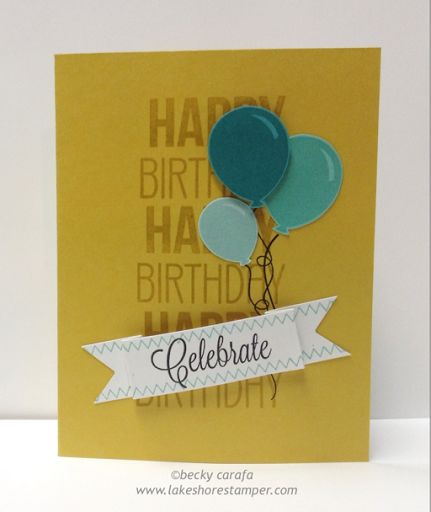 I then stamped balloons (Happy Everything) in three colors of blue on scrap paper and cut them out. I arranged them on my base where I wanted them, then stamped the tails (Happy Everything). I then adhered the balloons in place. I created the banner by cutting a strip of white cs, notching the ends. I stamped the sentiment (Happy Everything) and stitches (Basic Backgrounds & Borders), and then folded around the sentiment and adhered it to the card front. Thanks for stopping by, I hope you'll play along! Details can be found on the SYSC blog. All stamps from Clearly Whimsy. Great birthday card, Becky! Love the unique design.